Eric Larson is a New York Times best selling author. His books are unique in that he researches historical events and tells the compelling story by weaving actual diary entries or newspaper accounts into the narrative. This is the second book I’ve read by him, the previous (In the Garden of Beasts) being about the rise of the Nazis in Germany from the viewpoint of the US ambassador’s daughter to Germany at the time. “Dead Wake” refers to the wake left by a torpedo ejected from a World War I German U-boat. It is the tragic tale of the cruise ship the Lusitania, a contemporary of the Titanic. It was one of the largest passenger ships in the world at the time. The Cunard line Lusitania left from New York in May of 1915 heading for Liverpool. The British ship was full of mostly American and British passengers. At this time, the German submarines, called U-boats, were taking down many ships coming to the UK. They did this to stop arms and other supplies from reaching their enemies in World War I. The German embassy in New York warned Cunard publicly that they would try to sink the Lusitania, but with its vastly superior speed and carrying thousands of civilians, no one thought they were in actual danger. The captain was aware of the possibility and they did take some precautions, but not enough. On a lucky shot, the submarine, Unterseeboot-20, sank the boat, killing thousands of civilians, including women and children. 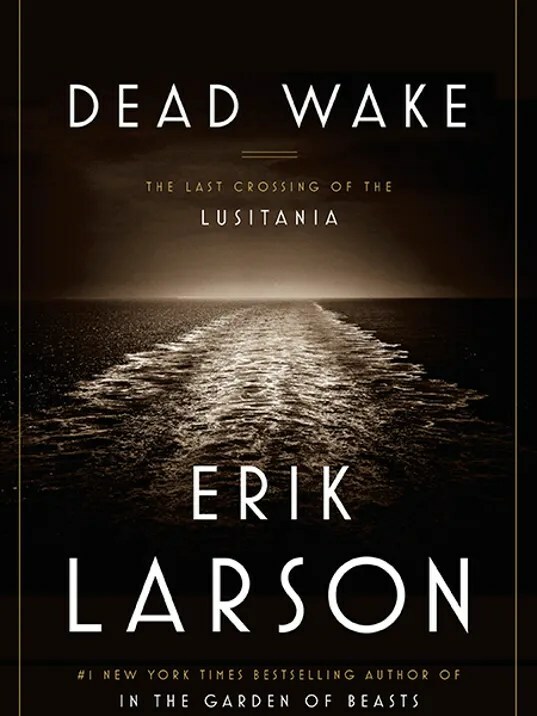 Larson describes daily life on the Lusitania and U-20, bringing the two together on that fateful day in May. There are several villains in this story, the biggest being the U-20 captain Walter Schwieger, who was on his own in charge of the submarine. I don’t know how he could have lived with himself, knowing that his shot killed entire innocent families. Schwieger got his a couple of years later, running into a British minefield with his submarine. There were some arms being carried on the boat, but not enough to make a difference to the war effort. Why Cunard lines didn’t give the boat more protection, why the British navy didn’t warn Lusitania when they had good intelligence that the submarine was in the area, are beyond me. Cunard takes a lot of the blame for in the name of profit, risking the lives of passengers by traveling in an unsafe area during a time of war. It is somewhat like the recent downing of the Malaysian airlines over the Ukraine. Those weeks of openhearted American hospitality and forth-comingness, of frankly expressed pleasure in meeting one, did something for me that made a difference to the whole rest of my life. A British passenger describing her time in the USA.